My little 9 week old 1 lb.4oz. 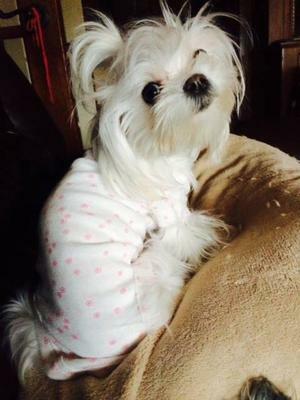 Maltese puppy is her Mama's little Mia. She is already attached to my side and a true snuggle bug. But... when she wakes from her beauty rest she dances & prances just like in the movie Mama Mia! We were love at 1st lick! 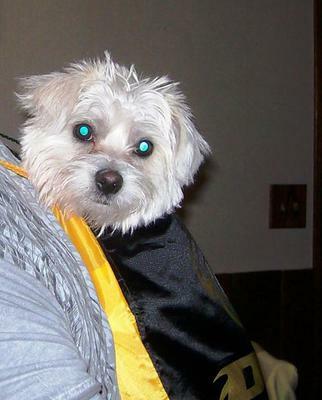 I lost my Maltese Shitzu mix a month ago to Intervertebral Disc Disease she would have been 4 years old on July 23 2013.Her name is Angel and everyday is hard we miss her so much. Angel was my best friend. She was pure white looked like a full blooded Maltese except for her spotted pot belly.She was so smart loved everyone especially the grandkids. Angel was jumping around playing like she always had and she just stopped and looked at me like mommy help me ..all of a sudden she could not move she was paralyzed from the head down.It broke my heart I took her to our vet and after a week in the hospital going there every couple of hours to hand feed her and give her water through an eye dropper. VOM treatments, Lazer treatments a couple thousand dollars later we had to put her down she was in pain and suffering. That was the hardest thing I had to do and she just looked at me as I layed my head on the table next to her because she couldn't pick her head up she licked my face and begged me to let her go she cried we cried together. She only weighed 9 pounds. Angel was a gift from my husband 4 years ago for my birthday and I had just lost my mom to lung cancer that's where she got the name Angel for my mom. My birthday was July 28th and my husband brought home our new puppy hoping it would help my pain and help me heal faster. She could never take Angels place she was on in a million. Your story had me in tears. 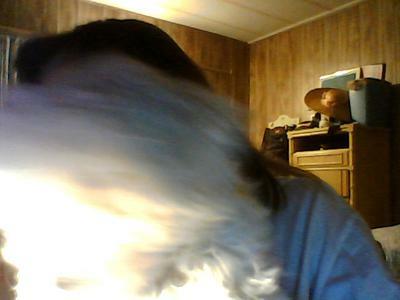 I have a little Maltese/pom cross that I love dearly. The day she leaves me will be my saddest day. These little fur balls bring so much joy and love into our lives. It's not fair that they don't live longer lives. I am so sorry to hear... I am BAWLING..I know its hard I would love to talk to you more my facebook page is https://www.facebook.com/JENNIFERWELCHINDIANA I to have a sort of similar story ... your story touched my heart...Thank you for sharing!!! 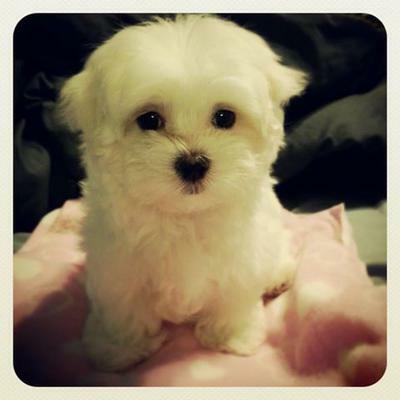 I named my Maltese puppy Helen taken from Helen of Troy. 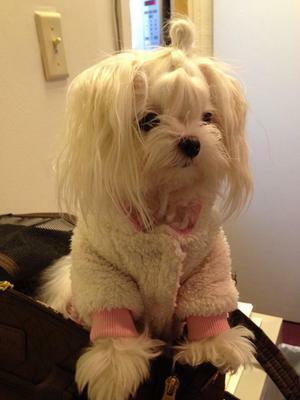 I was then searching for a well-bred Maltese from different home breeders and after several attempts, I just couldn't find the perfect one. However, one Saturday afternoon, I searched through the net and was captured by the picture of this very beautiful 3-month old Maltese puppy. So, I immediately contacted the breeder and arranged a schedule for viewing. When I set my eyes upon this puppy with round, black eyes and cottony white fur, I immediately fell in love with her. So, I didn't take time to think twice of whether or not to purchase her. I just did right then and there! I took her home. However, I forgot to ask permission from my Land Lady (of my dorm) that I will be taking in a puppy. I almost got kicked out. Nevertheless, I bargained with my Land Lady, which means additional rental cost. I'd rather pay additional rent than lose my Helen. My little girl was a rescue. I already had a little Yorkie named Jaxson. I wanted to remain with the letter "J". After going through several names with a J and after seeing her, I gave her the name "JENNY". When she looks at me I know her name is just perfect for her... she's truly a little "Jenny." 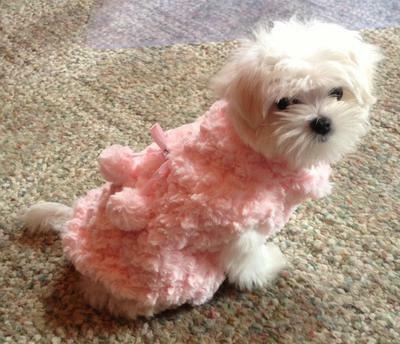 My daughter chose Bella for her Maltese. She received her when she graduated from college. My husband and I fell in love with Bella and wanted one of our own. We bought Bailey a few months later. He is the sweetest little thing. The names just seem to fit them. Bella now lives with us most of the time, I can't imagine her not around. 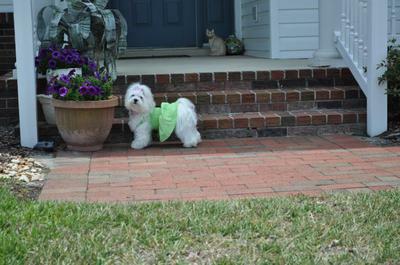 We enjoy our two Maltese so much that we are hoping for a third one. I chose the name Beli because it means "white" it's a Slavonic word beli meaning 'white. I thought it fit perfect. Paxie was actually named after a small town called Paxington. I got Paxie when she was 5 months old. Her previous owner knew her own health was not in good condition. She wanted to make sure "Paxie" had a wonderful home before passing on. 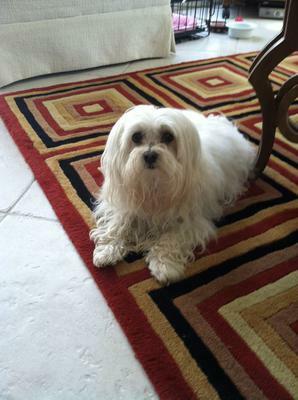 Paxie and I would visit with the previous owner every Sat for about 4hrs until the day of her passing.. Paxie is 5yrs old today and am purchasing another Maltese Friday and looking to get some help on a unique name for him. What a loving, giving heart you have! Hearing your story, gave my heart a smile! cause he super cute and I LOVE Canada! Love. That name. 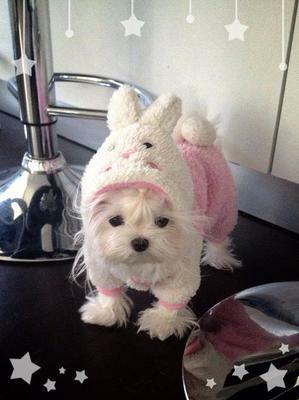 Regina is a great Maltese name.